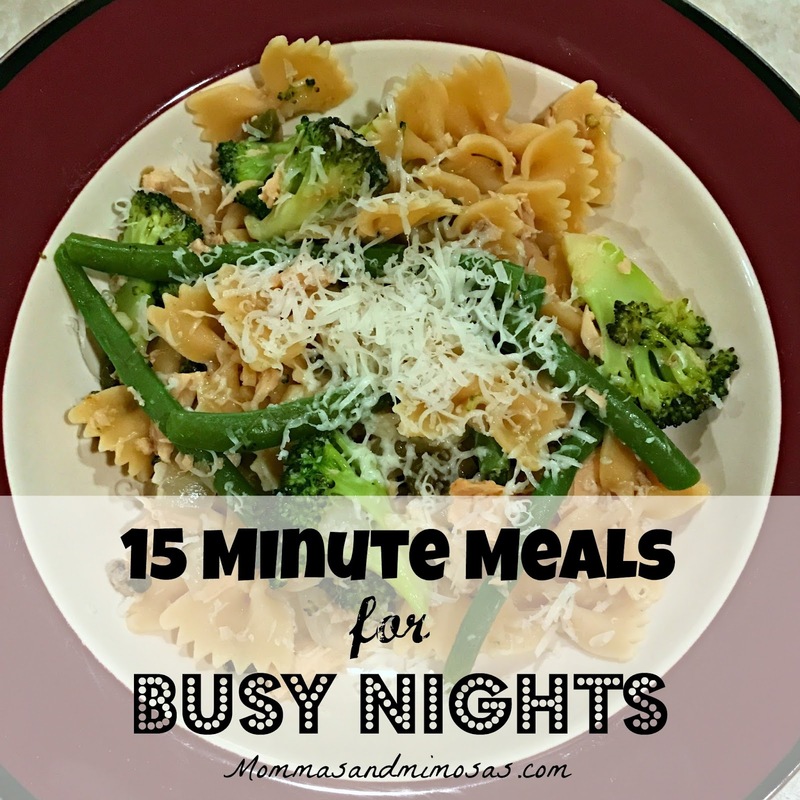 We all have those days when the kids have something after school, and you are pressed to get dinner on the table fast (before I become hangry mommy). Then there are days when I just don’t feel like cooking, but I don’t want fast food or another pizza. 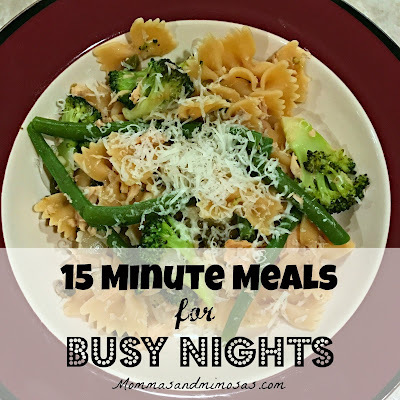 I still want a healthy dinner (my skinny jeans need me to have a healthy dinner), so I have been trying to come up with some fast, reasonably healthy dinners done in 15 minutes for at least one day during the week. This week’s dinner, Pasta with Tuna and Lemon Caper sauce, was not only fast, but someone who shall remain nameless put off going to the grocery store (okay, it was me), so it uses some pantry staples and leftover veggies. It can easily be tailored to what you have on hand. And miracle, even the kids ate it with minimal complaining (my kids are a little weird though and love capers). So here it is….. While your water is boiling for your pasta, you will want to get your ingredients ready. I say this because I always think I can chop, open cans, drain, etc., fast enough while my onions are cooking, but I always burn the garlic. Burned garlic is bitter garlic, so learn from me, and get your stuff ready or at least mostly ready while the water is boiling. Boil water for you pasta. I used bow-tie pasta (the high protein one), but you can use anything you have. While your water is coming to a boil, chop up half an onion, and a couple cloves of garlic (or however much you like - I used about a tablespoon), and any vegetables you want to add. I used green beans that I had left over. If you are using veggies like green beans or broccoli, that require a bit more cooking time, throw them right in the boiling water with your pasta for the last 4 to 5 minutes of cooking time. You will also want to get your tuna cans open. I used two small cans packed in water, because that is what was in the pantry, but it does taste a little better with tuna packed in oil. If you use packed in water, I don’t drain the tuna, I just add water and tuna in, but I do drain for tuna packed in oil because that gets a little too oily for my taste. You could also forgo the butter and olive oil and use the oil from the tuna can. Once the water comes to a boil, add your pasta and cook according to package directions. We used 1/2 box of pasta because my kids don’t eat that much (yet). During the last 4 or 5 minutes of cooking, I threw my green beans (or broccoli) into the boiling water to cook with the pasta. While the pasta cooks, heat about a teaspoon or two of olive oil and a tablespoon of butter in a large sauté pan over medium heat (the olive oil keeps the butter from burning). Add the chopped onion and a pinch of salt and sauté for about 2 minutes or until the onion begins to look a little translucent. If you are adding quicker cooking veggies like, red pepper, asparagus, kale*, spinach* or frozen peas, cherry tomatoes, do it now and sauté for about 2 more minutes, then add the garlic. After about another minute, add the tuna and capers. *If you are using baby spinach or kale add it when you add the drained pasta and lemon juice. Reserve about a 1/2 cup of the pasta water and drain the rest. Add your pasta, lemon juice/white wine, to the sauté pan, and baby kale/spinach and gently toss. If there is too much liquid for you then let some cook off a minute or two. I also taste here and add salt according to my taste. Capers and olives are sometimes enough salt for some, although not for me, so I usually add some to my onions and veggies while they are sautéing. Grate some parmesan cheese on top of each plate, and some red pepper flakes for my husband and I, and you are done. If you are vegetarian or are out of tuna - you could substitute a can of cannellini (white navy) beans for the tuna.